My Dimples "Mega-Bundle" arrived very quickly. Thanks to Andover Fabrics for being so generous! I don't know if I will ever win a contest again - so this is pretty exciting to receive my favorite thing of all time - lots and lots of fabric! The possibilities! There are 135 fat quarters- nearly 34 yards. The Dimples collection is basically a "textured basic" stash builder - not quite a solid and very versatile. I got stalled with this project nearly a year ago because I got frustrated with the linear nature of the Jack and Jenny prints - don't get me wrong, the fabrics are adorable! But my problem was that I was trying to incorporate them into the strip design of this quilt and I didn't like how slanted the prints looked when you cut them selvage to selvage. I didn't care for the way you had to cut off bits and pieces of the donkeys and boots and how crooked it looked.... So this weekend, I decided to scrap the strips I had cut and just focus on doing fussy-cutting of the fabrics for the framed squares. I love how it turned out and I am sure I can finish this in time for Charlotte's first birthday. The donkey/boot fabrics came out right around when she was born and I was so close to buying the boyish versions because I was sure that I was having a second son - it's a good thing I waited and I remember feeling especially thrilled to have a real reason to buy the pink versions. But Charlotte is showing a gradual affinity for the quilts that I have made her. How sweet is this picture? 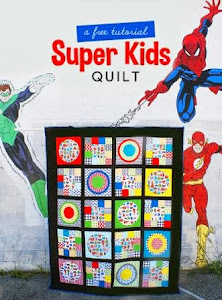 This is definitely an image that explains why I quilt - no explanation necessary. Wow! That's amazing stash you just got. Congratulations again! Congratulations,that`s great.Your kids pictures are just adorable.Happy sewing!! That picture of Charlotte is adorable. 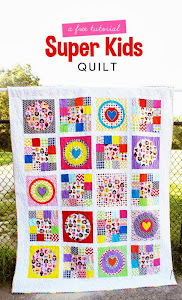 It's so wonderful when people use and love your quilts. Those wellies look great! I never imagined it in a quilt like that. I will definitely bring the piece I got by accident in for you. I've put in on my list for the retreat. Congratulations again on winning. Wow a royal giveaway! Happy dance for you!